Hammertoe is a foot condition in which one or more toes is abnormally bent. These foot deformities occur as a result of injury or long-term wear of poorly fit shoes. Though anyone can develop hammertoe, it is especially common in women who have a second toe that is longer than the big toe. 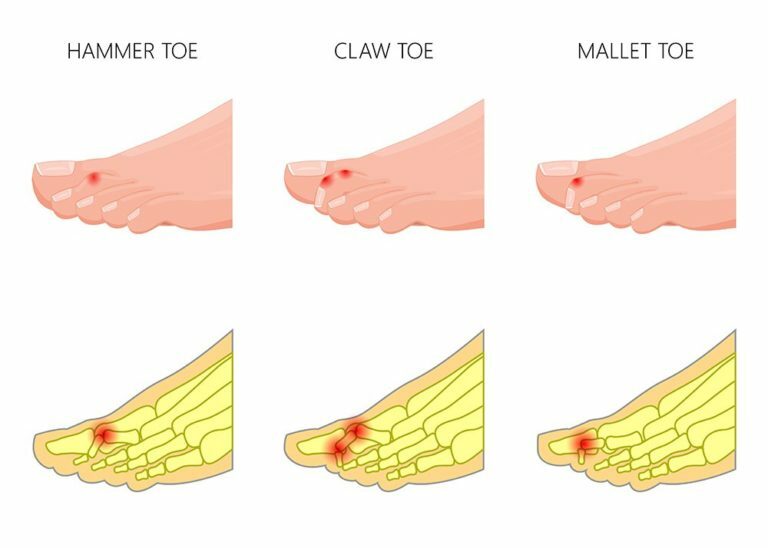 Over time, hammertoe may cause discomfort, pain, corns and calluses, not to mention permanent stiffening of the tendon in the affected toe. that hammertoe may be prevented by wearing properly fitting footwear? It is important to choose shoes that are roomy near the toes allowing, at least, a half-inch of space between the shoe and the tip of the longest toe. Keep in mind that the risk of developing hammertoe increases with age, so selecting properly fitted footwear is even more important over time. When should I see a podiatrist about the condition? Schedule an appointment with a podiatrist if hammertoe is making you uncomfortable or affecting your ability to walk. It is important to seek treatment while the toe is still flexible and more easily treated. Left untreated, hammertoe may progress to a permanent condition that requires more extensive treatment. What types of treatments are available to people with hammertoe? Treatment for hammertoe may include the use of foot orthotics, as well as physical therapy exercises that strengthen and elongate the affected toe. When conservative treatment measures are ineffective, patients may require surgical intervention to treat hammertoe.